On the town -- Where's the best "restaurant row" in Cincinnati? What are the best restaurant-rich neighborhoods in the Cincy metro area? Never mind areas that are heavy with mid-range chain eateries, even upscale ones. (That's about the best you can hope for in the outer suburbs, but I'd almost always prefer an independently owned restaurant to one that's part of a large corporation.) For the sake of this discussion I'll also omit clusters of bars and sports bars that don't offer much in the way of a square meal. And I'm looking for more than one or two "quality" places to eat, so that if one interesting choice is fully booked and you don't have a reservation, you might be able to find a comparable option without having to get (back) in your car. What works in Cincinnati/NKY and what doesn't? I think Clifton fails the above test -- alas, since that's my home 'hood -- because even though almost everything is independently owned, it's also almost all of mediocre quality, at best. Once you get past La Poste (a wonderful gem for which I thank God every week), things go south really fast. Don't even get me started on the inconsistent but mostly unappealing food at Olives, and the rest of the bunch is ethnic mostly Indian fare that cannot be justified on a health basis. Hyde Park actually flunks, too, because it is so full of chains. There really isn't a destination restaurant in that part of town, unless you want to count J. Alexander's, Seasons 52 or Bonefish Grill -- none of which is unique to our metro area. We love OTR/Gateway Quarter (Bakersfield, Abigail Street, Senate, Kaze, A Tavola -- just to name our favorites) as well as downtown (though less so -- although Local 127, Jean-Robert's Table, Boca, Red Roost Tavern and one or two others are quite good). Northside is high on quirky, tasty and low-cost options (Take the Cake, Melt, Django, among others) but doesn't have anything to compare to any of the others named in this paragraph. This is a long-winded way of leading into my vote for Covington, specifically the Main Strasse area that consists of at most three blocks along Main Street within sight of the Brent Spence (I-75) Bridge. Bouquet is the top-shelf entry and worth at least a couple of visits a year. But the street also has the Old Kentucky Bourbon Bar (and I'll add a photo of my very authentic whiskey sour from the other night) as well as a handful of quite acceptable if less stellar tables. We dined at Otto's (photo is of my shrimp and grits entree), and on the same block Chez Nora (so-so food but a great rooftop bar), the new Main Bite (haven't tried yet) and the old standby Dee Felice (never been a fan but others like it). 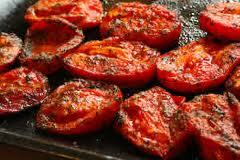 One of my favorite healthy-foodie writers -- Martha Shulman, who does the "Recipes for Health" column in the New York Times -- has produced a roundup of her current (summer 2013) favorite ways to prepare tomatoes. Remember, the season for fine tomatoes is fleeting, so it's time to buy lots of them and cook (or not) in many different guises. Click here to see what Martha has in store for us this summer! You'll find such treats as Super Tomato Sandwiches, Soft Tacos with Roasted Tomatoes, and Amazingly Sweet Slow-Roasted Tomatoes. Corn, zucchini, bell peppers, onions, garlic, tomatoes, peaches, eggplant -- these are just a few of the fresh, local produce now available at farmers' markets nationwide. I like to make a big pot of succotash -- or what I call "soycotash" because I use edamame instead of Lima beans -- for a delicious side dish, using many of the above ingredients. It's fairly simple although it does require a lot of knife work. Cut the kernels off a few ears of corn, slice 2 medium zucchini or yellow squashes, dice a red bell pepper, 1/2 onion and mince a few cloves of fresh garlic. Saute all those ingredients in canola oil, add a cup of frozen, thawed edamame along with seasonings (salt, pepper, chopped herbs of your choice) and voila! With the leftovers, I made this 'tash-stuffed bell pepper as a vegetarian entree. I added a chopped jalapeno pepper to the succotash to give this dish a bit of a kick. Preheat oven to 400 degrees. Place peppers, cut side down, on a lightly greased baking sheet. Bake for 10 minutes, until peppers just becoming tender. Set aside. Reduce oven temperature to 375 degrees. Lightly oil a 9-by-13-inch baking dish. Stir the cheese into the succotash, then divide the succotash among the pepper halves. Place in prepared baking dish. Add 2-3 T water to the dish. Cover with foil and bake for about 15 minutes, until heated through. Uncover and bake for 5 minutes longer. Serve! My husband and I recently spent a couple of weeks in Spain, where tapas bars and tapas menus are ubiquitous. Much of the time, the food was disappointingly pedestrian. In several cities it seemed as though all the restaurants were operating out of a single, unimaginative and mediocre kitchen -- sort of the same experience I've had in places like Little Italy in New York. Too much of the same thing! How happy we were to find Curate (pronounced KOOR-ah-tay), in downtown Asheville, NC. Just take a look at the menu, available here, and your interest is likely to be piqued. We were in town for three nights and managed to eat here twice: for dinner, at the bar (which you also can reserve, and we did), and a couple of days later for lunch. You almost can't go wrong no matter what you order. --Dessert: "Sabores del mediterraneo" -- apricot sorbet, sweet yogurt mousse, candied pine nuts. With dessert, I had a glass of sherry that was a perfect match. Curate is at 11 Biltmore Avenue in downtown Asheville, NC. What a great town this is, and definitely fit for (healthy) foodies. We drive home on Sunday. Soon thereafter I will write more about what to eat in this very cool, hip Carolina mountain town. For our 18th wedding anniversary, my husband and I dined at the new restaurant in the Hyatt Regency Hotel downtown, the Red Roost Tavern. It's an impressive operation, combining a front-of-the-house sports bar atmosphere with an expansive bar and a dozen large-screen TVs and a more intimate dining room facing the open kitchen in the rear. On our Monday night visit the bar area definitely had a lot more patrons, but on other nights the dining room also fills up, according to staffers. How to describe the Roost in a nutshell? What impressed me, at least, is its farm-to-table orientation, a varied menu that includes plenty of healthy choices but also heartier and more casual fare, and an environmentally conscious approach to everything from sourcing of ingredients to recycled materials in the decor and an Eco-friendly kitchen. We started by sharing one of the entrees as an appetizer -- an organic grit cake that turned out to be our favorite dish of the evening. The grits are enriched by a touch of smoked Gouda, and is presented with fava bean and corn succotash (also available as a side), crunchy kale chips and dried cherries. Highly recommended! There are three salads on the dinner menu, and we each had one. The Quinoa Salad my husband had was a winner--lightly dressed, a tasty combination of chewy grains and crisp veggies. The grilled radicchio on my Baby Romaine Hearts salad was the bomb -- I just wished there had been more of it and less of the relatively boring romaine. For entrees, he had a big, fat, juicy burger -- not a beef but a bison burger, layered with avocado, arugula and Gouda. My Salt Grilled Shrimp was more than I could finish, as were the sides I had chosen, but it went home with me for future consumption. We appreciated that each entree comes with two side dishes, and the choices included the expected mashed or roasted potatoes as well as a few more unusual options, such as "crunchy cauliflower" and pan-fried quinoa or peppered pappardelle. I thought that the cocktail list was adequate -- I had a serviceable mint julep -- and the wine list barely so. (My husband suggested that the restaurant doesn't aspire to offering significant wines, just enough familiar varietals to provide acceptable accompaniment to the food.) I would add that an upgrade in the glassware would make me happier. All they had were small, white wine type glasses -- which I don't even like for white wine -- that diminish one's enjoyment of a wine's bouquet and taste. We'd had a big meal and shouldn't even have ordered dessert....but we did share (and only half eat) a lemon enhanced creme brûlée that would have been delicious under other circumstances. Overall, I think Red Roost Tavern will and should be a success in its location. The hotel chain has invested millions in refurbishing the lobby, meeting space and guest rooms here, and being across the street from the Convention Center will bring in lots of business to the restaurant and bar. Red Roost replaces the old Champ's sports bar, and is open for breakfast, lunch and dinner seven days a week -- another good thing for downtown, since it can be hard to find a nice meal on a Sunday. Healthy foodies, you're going to be happy here, I think! Great time at Red Roost Tavern! Full report coming very soon, but here's a preview: an organic grits cake with fried kale and summer succotash. Major yummy! Red Roost Tavern is a new, farm-to-table oriented restaurant in the Hyatt Hotel in downtown Cincinnati. It replaces a Champ's (sports bar). What an upgrade! For most of the year, my blender sits in the back of a kitchen cabinet. But not in July! Now is the time when a fruit/yogurt/juice/soy milk (or some combo of those) smoothie is just right. I like them best at breakfast alongside my daily mugs of hot, milky tea. But a smoothie can be good as your lunch, too. The other day I made a blender full of the following ingredients: one ripe banana, a cup of sliced mango, a cup of vanilla soy milk, about 1/2 cup plain yogurt and the same amount of orange juice, and a few packets of Splenda. Whir in the blender, and after a minute or two add a cup of crushed ice. You can share this with someone, but I have the whole amount in a couple of helpings. It certainly is filling and also is packed with vitamins and a healthy amount of fiber. Experiment with the ingredients you like best! 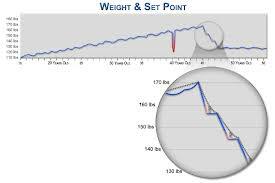 Lowering/Changing Your Body's "Set Point"
It's no myth that our body weight will hover near a "set point" unless we make significant changes in our calorie intake and expenditure. Recently, I've decided that I'd be happier with a somewhat lower body weight. (Okay, I'd be even happier with a significantly lower one, but realistically, that's not going to happen.) Perhaps coincidentally, my husband currently is trying to increase his by a few pounds. But most of us will never have the task of trying to gain weight, so I'll focus on how to drop, not add, to our set points. 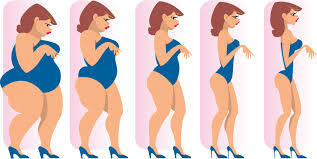 I've looked into what it would take to coax my body into settling about five pounds lower. Once you achieve a certain set point, you have to work pretty hard -- or splurge big-time for a sustained period -- to move it again. I found a really helpful site that explains the body weight set point concept and gives instructions about what to do if you want to change it. Click here to read the details. The core principles of changing your set point are to Eat less/shed pounds; Eat well (healthfully); Move more; Sleep more; Stress less. At the end of each day, code your progress by the R-K-O Method as follows: If you have eaten healthfully and exercised sufficiently, give yourself an R (for regular reducing). If you do one or the other but not both -- eat well or exercise -- you get a K (for keeping the same). On any day that you basically blow it all off, eating too much and slugging out, score it an O (for off day). Try to have as many R's as possible, especially R days in a row, and you will lose weight and start moving your set point. I have bookmarked this -- http://www.bidmc.org/YourHealth/BIDMCInteractive/BreakThroughYourSetPoint (see full link highlighted above -- because it seems highly useful. Included are videos, podcasts, charts, a food diary template, and lots of other crutches that you might want to consider using. The site also advises not to try to lose more than 10% of your weight, and notes that losing even a few pounds (and keeping it there, thus lowering the set point) has significant health benefits. Tired of my vacation yet? This will be my last entry about our June trip to Spain and France......because we are at the last stop, which was the great Mediterranean city of Nice, France. It's my fourth lifetime stop in Nice, which ranks in the top five cities that I've ever visited. We stayed at a marvelous hotel called La Perouse, located up a hill from the (over) crowded Promenade des Anglais and just a few steps from our favorite part of the city -- for dining and shopping -- Vieux Nice. I'm just going to post a few more photos of the hotel, the food we had there and elsewhere in Nice, and a shot or two of the sea. Then, back to reality...........and my theme of eating healthfully. When I mentioned this Rhone Valley town to my sister-in-law, she said, "Ooh, the wine." And a young Cincinnati bartender we know said that Chateauneuf-du-Pape was the first red wine he ever tasted and liked. Of course, the town is best known worldwide for its complex red wines, but it is also a cute, small town with a couple of excellent restaurants, plenty of tasting rooms, and the ruins of a medieval Pope's summer chateau. We visited only one winery, the lovely Chateau la Nerthe in the valley near the town, where we had an appointment to tour the caves and try some of their very hard-to-find white wine blends. We also had lunch in town at Le Pistou, where I had perhaps the most interesting and tasty single dish of our trip to Spain and France: this salad featuring sliced, cured duck and delicious melted cheeses on toast -- among many other delightful things on the plate. As was the case most evenings, we had a picnic in the gardens of our hotel at dinnertime. If I had another life to live, it would be in Provence. In lieu of that, a week there and on the nearby Cote d'Azur (aka the French Riviera) sufficed for now. Our finest dining of the three weeks in Spain and France turned out to be three lunches in Provence--in Arles, Avignon and Chateauneuf-du-Pape, three successive delicious days in June. First up was at the bistro adjoining L'Atelier de Jean-Luc Rabenel, a Michelin two-star establishment in the center of the old, Roman city of Arles. After touring the ancient coliseum and other sights, we had a late lunch at the Bistro a Cote. The three-course daily menu offered three choices per course. Most interesting was this composed Salade Nicoise, which my husband and I both chose as our first course. We sat on the breezy terrace -- it's on a cobblestone street, charming but not especially picturesque -- and chatted with a gay couple from San Francisco throughout our meal. The next day we drove to Avignon, another notable sightseeing town in Provence. Once again, after touring the (in this case) medieval palace of the Pope, we sought out a restaurant recommended in one of our guidebooks. Little did we know that this would be the best meal of our entire trip, at another Michelin one-star, Christian Etienne. The second floor room above the old part of the city had open windows and a fresh-air feel; the service was impeccable; and everything we drank and ate was marvelous. I had the best veal I can ever remember. Here is a shot of the first course, a soupe du poisson, along with the Champagne cocktail and glass of white Rhone wine that was at my place. Of course, I had to try a red wine to go with the veal. And then came this lovely dessert. 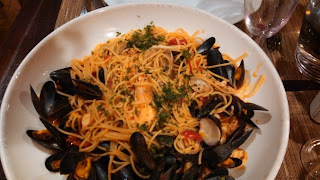 Next time, I'll show & tell about what was my favorite single dish of our wonderful time in Spain and (especially) France.